Most homeowners focus on cabinetry and appliances when updating their kitchens and may forget a key focal point that can make a strong statement: the backsplash. 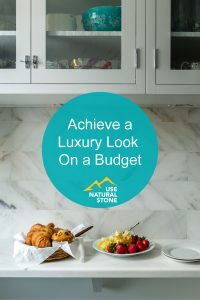 Using natural stone for kitchen backsplashes is not only functional, it adds an element of elegance and architectural detail in the space just above the kitchen sink or stove. Statuary marble. Photo courtesy of Lauren Coburn. Backsplashes can provide an instant opportunity to create a statement, especially if the countertops are visually quiet, according to Lauren Coburn, owner of Lauren Coburn, LLC. Alternatively, a quiet backsplash can draw the eye to a countertop with more movement and visual interest. 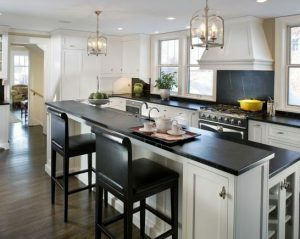 Coburn recommends considering the countertop and rest of the kitchen space when choosing a backsplash. 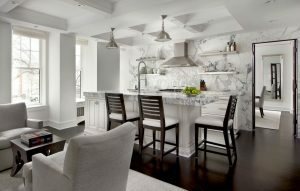 “The ‘art’ in the kitchen has to be carefully chosen and minimized visually,” she notes. The biggest mistake people make, according to Coburn, is creating too many focal points. 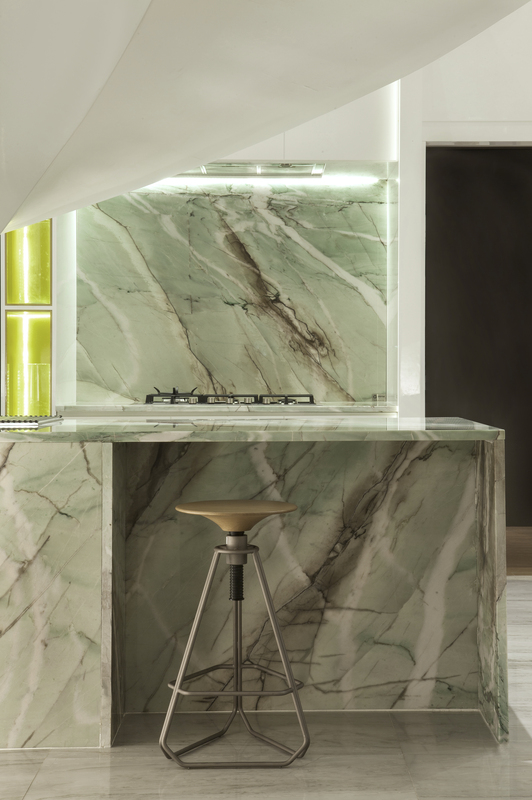 Cristallo Tiffany quartzite. Photo courtesy of Aria Stone Gallery. 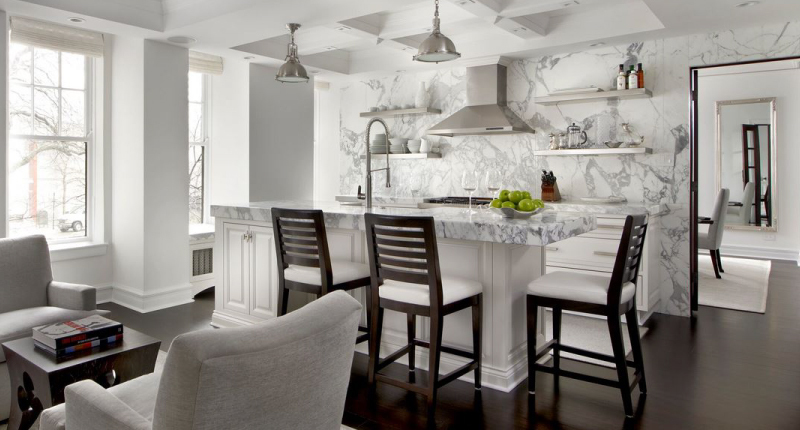 She advises clients to consider choosing either a busy backsplash or busy countertop (such as one with veining). Choosing two materials with competing movement can make it hard to focus on either. “Your eye doesn’t know where to go,” Coburn notes. Graves likes to remind clients that if a stone can be used on a countertops, then it can certainly be used for a backsplash. 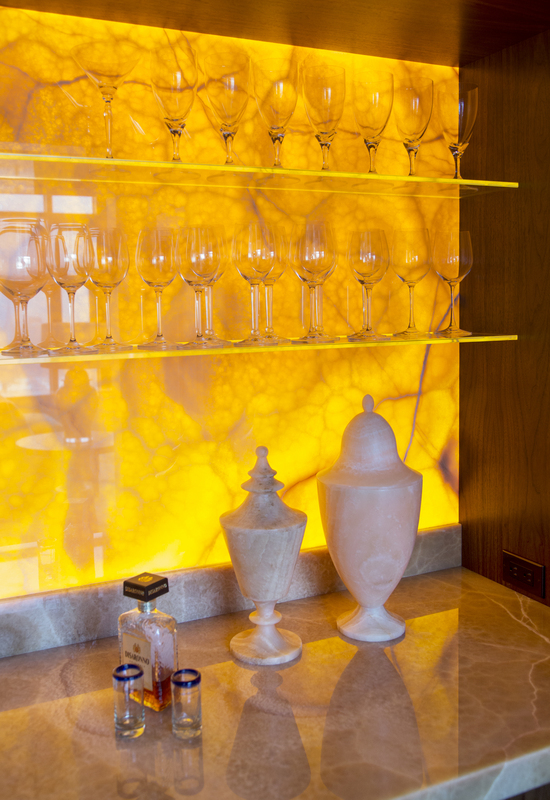 “Marbles and quartzites usually make the greatest impact on a space, since they come packed with personality, color, movement, and elegance,” she shares. Calacatta Cremo marble. Photo courtesy of Aria Stone Gallery. 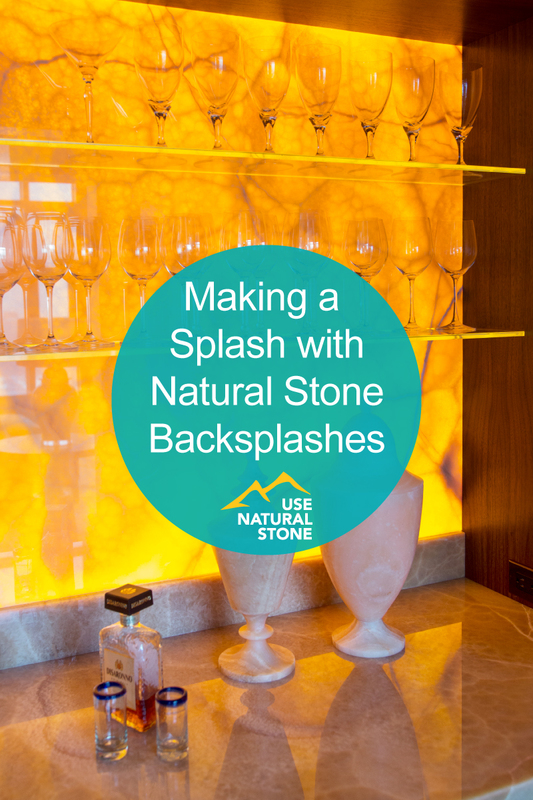 There are a few other things our expert remind homeowners to consider when selecting natural stone backsplashes. Several considerations deal with practicality. To avoid disrupting the backsplash visually, Coburn suggesting using plug molds versus outlets. These can be installed by an electrician. “You can plug appliances into the plug molds concealed in the cabinets above so you don’t have outlet plates on your backsplashes creating disruption in the design,” she explains. “Leaving outlet covers off the backsplash creates a much more seamless and simple look and makes your backsplashes pop without interrupting the movement.” Plug molds also make it easier to clean a backsplash when oil or other things splatter while cooking. Coburn also cautions clients to consider that any backsplash must hold up to heat if it is near the stove. Many people make the mistake of not checking with the vendor on heat requirements. 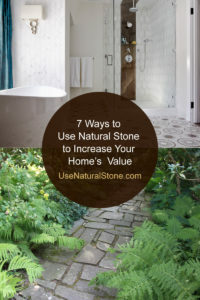 Most natural stones are naturally heat resistant. Soapstone backsplash by The Woodshop of Avon. Graves likes to share with clients that soapstone is 100% heat resistant and nonporous, which makes it particularly well-suited for busy areas like the kitchen. According to Graves, any type of stone can be used for a backsplash, as long as they are protected and treated with love and care. Other things homeowners should analyze is how much space is needed between your backsplash and sink faucets or knobs before installation. “Consider where your plumbing is located, how large your sink and cooktop are, and the amount of space you feel comfortable functioning with, so that once your backsplash is installed you don’t feel like your hardware is crammed against it,” says Graves. 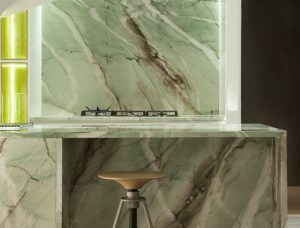 If installing a natural stone slab backsplash, another thing to consider is the thickness of the slabs. 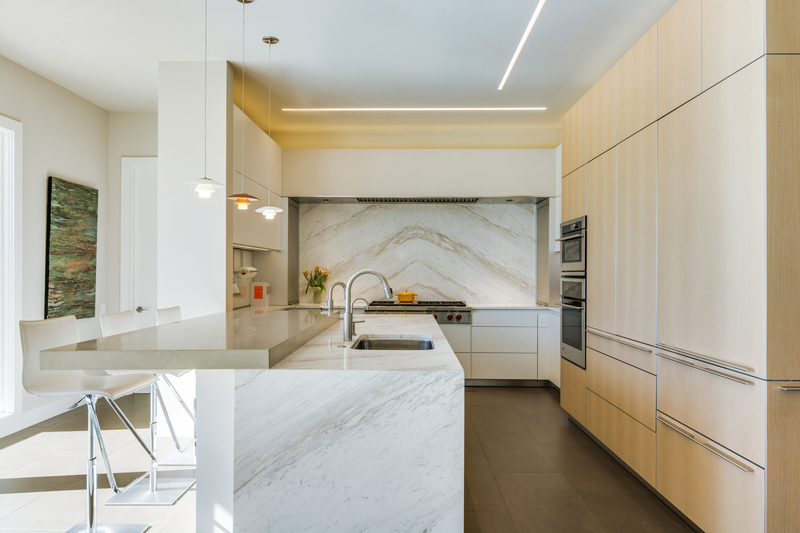 “Although 3cm materials will normally work well for a backsplash application, it is important to consult with your contractor before installation to be sure your walls are structurally sound enough to support the weight of such a heavy slab,” says Graves. 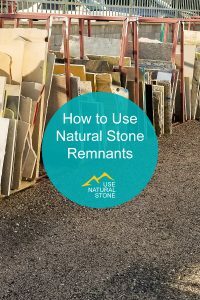 “If 3cm stone is not an option, or you do not prefer your stone to jut out from the wall as much, it is possible to have a fabricator mill down your slab to become thinner.” A reputable natural stone fabricator will be an important resource for any stone installation. 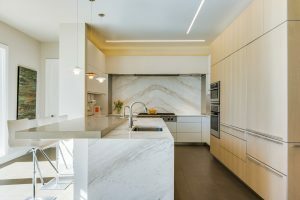 Bookmatched natural stone backsplashes are still as popular as ever, and continue to take the design world by storm, acting more as a feature wall as opposed to a backsplash, even if technically they perform the same function, according to Graves. Backlit Honey Onyx. Photo courtesy of United Marble Fabricators. “We always love the way large bookmatched slabs tie a space together and add a sense of direction, while also creating a beautiful, organic focal point,” she says. 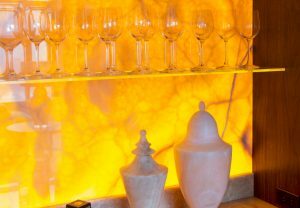 Another trend is to use the same stone for the countertop and backsplash, creating a smooth transition from surface to surface. Graves notes that using that same stone as a floating shelf will likewise add an open, yet streamlined element to the space.